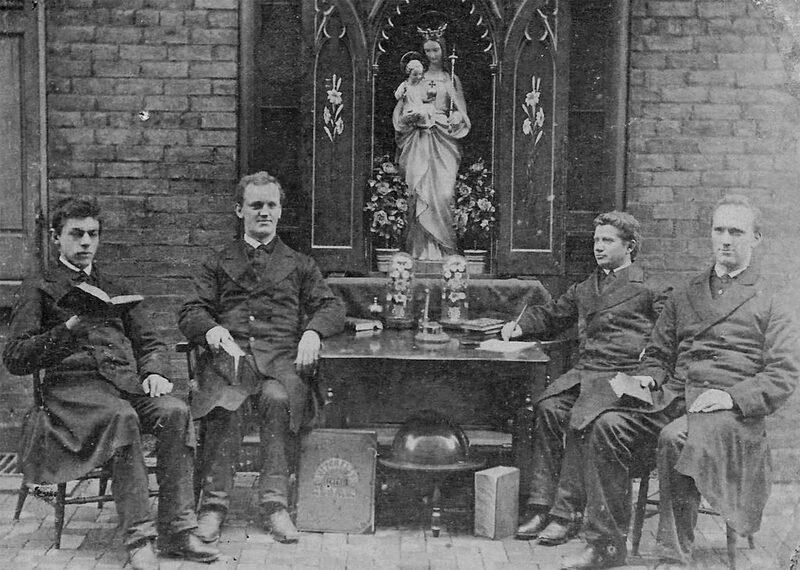 Marianist brothers in Cincinnati in 1876. This is among the oldest photos of U.S. Marianists. Jesus, Mary and Joseph comprise the Holy Family, the basic unit of God’s strategy for the Incarnation and Redemption. They belong together in the history of salvation. The three are inseparable and should be seen and understood together theologically, pastorally and in sacred art. We must not forget St. Joseph. What he did for Jesus and Mary, he will do for us personally and for the universal Church. In this third millennium of Christianity, Jesus and Mary will bring us closer to Joseph as we realize more clearly and deeply the mission of the Holy Family in salvation history. Veneration of St. Joseph will increase in proportion to the intensity of our devotion to Jesus and Mary. Like wife, like husband. St. Joseph’s feast day is March 19. St. Joseph the Worker feast day is May 1.